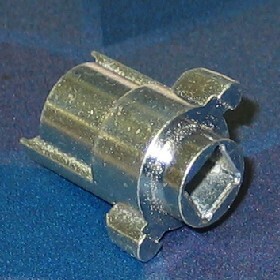 An Award of Distinction in the Hardware/Appliance Category of the 2013 Powder Metallurgy Design Excellence Awards Competition was presented to ASCO Sintering Co. for an inside hub adaptor that is used in modern, high-end electronic commercial and residential door-lock systems including the latest touch-screen devices. This highly engineered part made from near fully dense proprietary ASCO HI-IMPAC Copper-infiltrated Powder Metallurgy material has seven functional levels, surpassing the highest level of Class 5 complexity published by the Metal Powder Industries Federation MPIF. Tool design combines three upper punches, two separate shelf levels, and two lower punches, with a proprietary triple upper actuating mechanism to achieve extensive powder transfers and fill compensation. This Award winning design continues to demonstrate why Employee Owned ASCO Sintering Co. is considered one of the World’s leading experts in Conventional PM parts manufacturing. The adaptor is pressed net shape with Statistical Process Controls applied throughout the Compacting and Sintering processes to achieve 6sigma Quality levels. The only secondary operation performed is Zinc Chromate plating to ASTM B633 Standard for corrosion resistance. The solution provides over a 40% cost saving when compared to traditional manufacturing processes such as turning, milling or EDM. At annual volumes of 40,000, properties include 7.7 g/cm³ density, 95,000 psi ultimate tensile strength, 8% elongation, 100 ft-lb. un-notched “Charpy” impact energy, and 90 HRB hardness.